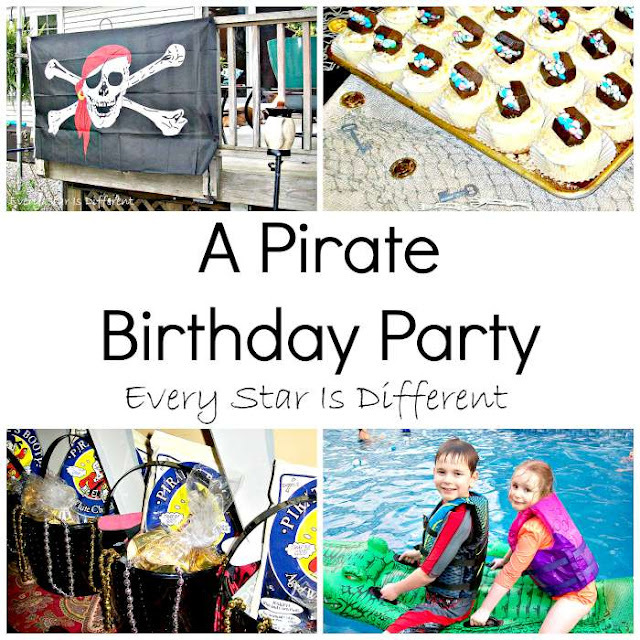 Each year we throw a birthday bash for all four kiddos. Princess' birthday is in July. Bulldozer's birthday is in August. Dinomite's birthday is in January. Sunshine's birthday is in November. Besides winter birthdays being so close to Christmas, the weather is always unpredictable. In order for extended family to come visit, they must drive through the infamous snow belt. So, we always have it in mid- to late summer. 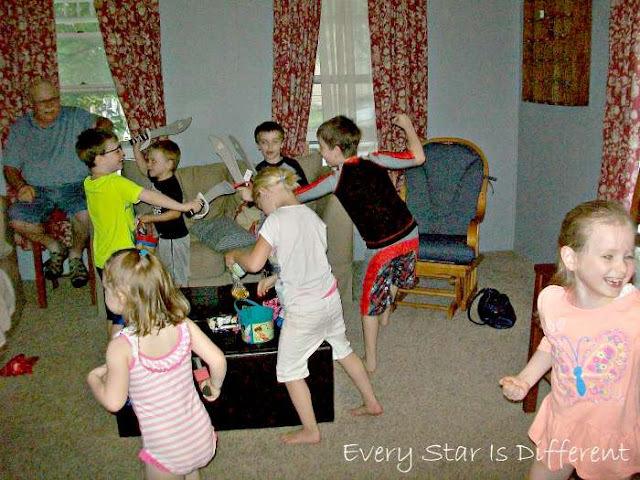 When we have our annual birthday party, we decide on a general theme, and then the kiddos pick out a more specific theme within the general theme, for themselves. 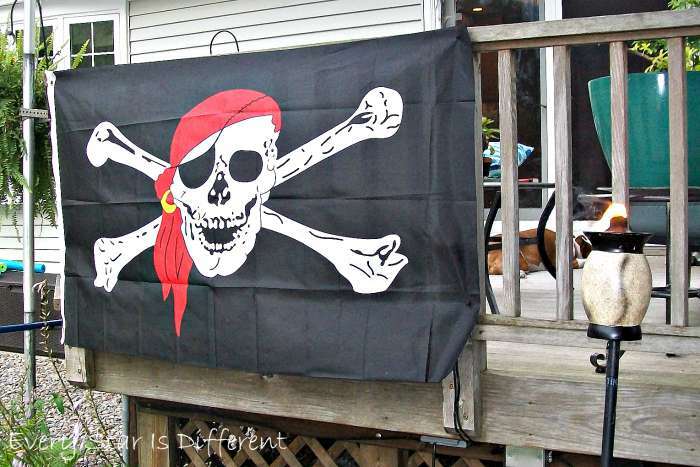 This year we decided on a pirate/Peter Pan theme. Dinomite is obsessed with Pirates of the Caribbean: The Curse of the Black Pearl right now. His focus for the party was Captain Jack Sparrow. Bulldozer loves Captain Hook from Peter Pan and from Jake & The Never Land Pirates.. Princess loves Tinkerbell and her friends from the movie, The Pirate Fairy . Sunshine loves Jake and The Never Land Pirates! Our original plan for the birthday bash was to have a pool party at a friend's home. We'd have a buffet of food for people to eat whenever they felt hungry. Those who wanted to swim could swim. For those who didn't want to swim, there was plenty of space to lounge and relax around the pool. 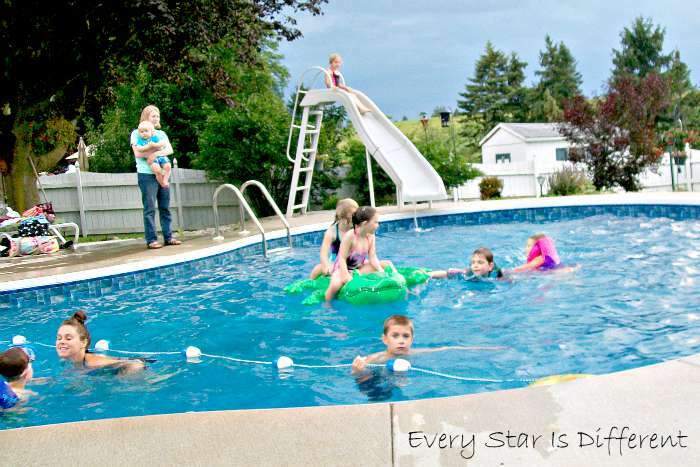 When the kiddos were ready for cupcakes, they could jump out of the pool and we'd all sing from where we were. Then everyone could grab a cupcake whenever they wanted. 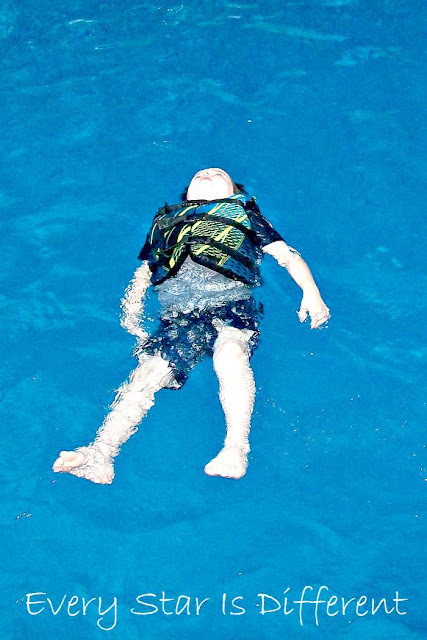 If the kiddos wanted to open their gifts, they could take a break from swimming. Others who wanted to watch could gather round. The rest could keep swimming etc. The atmosphere for the party was perfect. Tiki lamps, located around the pool, would be lit to keep bugs away, but also act as a decoration for Dinomite's theme. The pool would be our "lagoon." Bulldozer requested a Tick-Tock Croc blow up toy for the water. 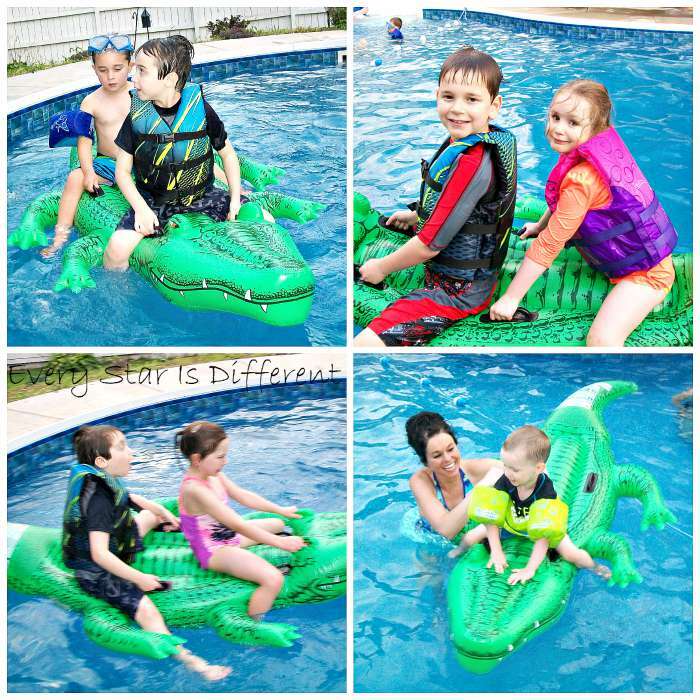 We purchased the Intex Giant Gator Ride-On, 80" X 45", for Ages 3+. When the sun set, the trees around the pool were illuminated by two Sparkle Magic Illuminator Laser Lights, Emerald Dust (Green) that left the trees shimmering and sparkling as if they'd been covered in fairies' pixie dust. Guests could stay as long as they wanted, eating, swimming, and relaxing. It was the PERFECT plan. And then... the weather decided to play crazy tricks on us. We had watched the forecast all week. Through Thursday evening, Saturday evening (our party date and time) looked perfect for our plans. Then, Friday morning the forecast changed. But rain and storms weren't guaranteed. There was a 50% chance. Jason and I literally watched the weather play out on an hourly basis. Of course when and how much rain and thunderstorms would come changed every hour. On the invitations we had said that if weather didn't cooperate we'd have the party at our home. Can I just say I was not prepared for that. I spoke with my friend, who's home we were having the party at to see what she thought. She suggested we wait and see, but if worse came to worse, we could always, start the party at our home with dinner, cupcakes, and presents, and then if the weather looked okay, head over to her place. The plan was quite ingenious. It had never crossed my mind. Still I had to have a back up plan in case we couldn't swim and I had to clean my house! Thankfully my husband was amazing at helping me through the cleaning process and a grandparent took charge of back-up games if we needed them. Saturday, the weather predictions continued to change every hour. We let everyone know the party would start at our place, and then, weather permitting, move to the pool. That way, I wouldn't have to worry about dinner, cupcakes, and presents getting rained on, if we all had to make a run for it due to weather. Since we would be inside, I set up the kiddos' learning time tables for all of our little guests to eat at. Other chairs were set up around the living room for adults. After dinner, we decided to sing Happy Birthday to the kiddos, have each of them blow out candles, and serve cupcakes. I had prepared and decorated a different batch of cupcakes for each kiddo. They helped choose what flavor cupcakes and how they wanted them decorated. I was so pleased with how they all turned out! Dinomite's cupcakes had treasure chests on top of them made using Hershey's nuggets and mini M&Ms. I made the cupcakes the day before and placed them in the refrigerator. While there, the dye on the M&Ms started to fade. I have no clue why, but that's how they remained. For directions on how to make these cupcake decorations, be sure to check out this post from It's Always Autumn. Bulldozer originally wanted cupcakes that looked like Peter Pan's hat, but then changed his mind last minute and wanted treasure. Since he's allergic to peanuts and tree nuts we couldn't use chocolate gold coins. Instead we used Rolos. 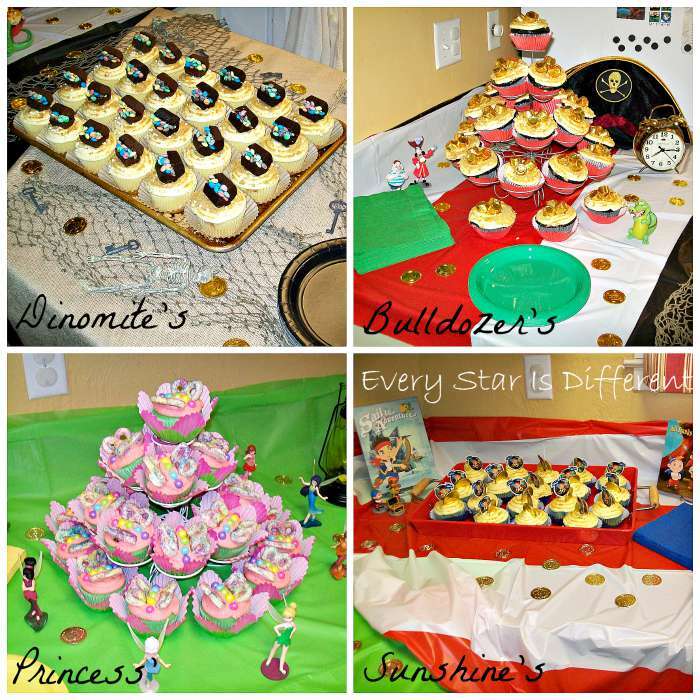 Princess' cupcake decor was inspired by Evi Enjoying Life. To make sure the entire treat was allergy friendly, I hand dipped all of the pretzels and then covered them with rainbow colored sprinkles. Pastel colored chocolate pearls were used for the bodies. Princess was SO excited about her cupcakes. I was extremely pleased with how they turned out. Sunshine's cupcake decor idea came from the same source as Dinomite's. I just added a little Jake and The Never Land Pirates cupcake topper to each one to make them specific to her theme. 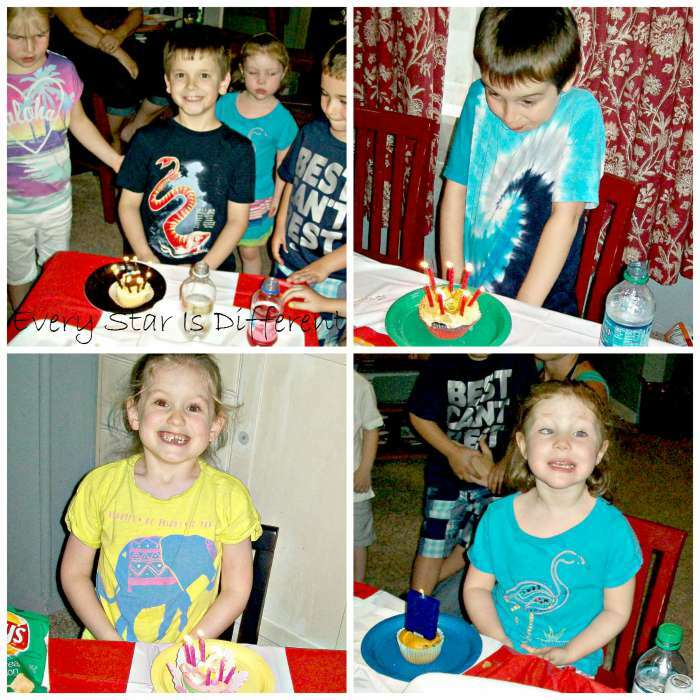 The kiddos did so well blowing out candles and eating cupcakes. I kid you not, there were no crumbs and/or frosting on the carpet anywhere. While the kiddos were eating cupcakes I checked the weather. I have another mother as my witness that it said there was a 0% chance of rain and thunderstorms for the remainder of the evening. Once the kiddos were done eating I announced we'd be heading to the pool to swim. The kiddos changed into their bathing suits and I handed out their goodie bags. I also made sure that any friends who wanted to watch the kiddos' open their gifts, gave them to them before we left. 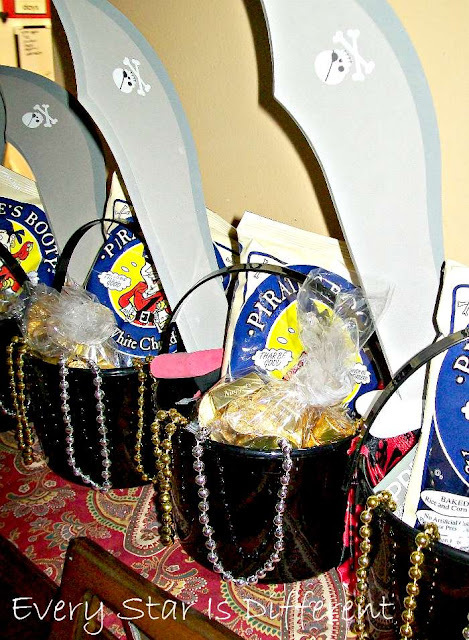 Goodie bags were filled with fun pirate items. Each of the kiddos received a bandana, eye patch and foam sword I found at Target. (A special thanks to my mom for shopping her local Target store to make sure we had enough for everyone!) Kiddos also received treasure which consisted of gold coins and necklaces. Lastly they received an individual sized pack of Pirate Booty and a bag filled with chocolate treasures (left over from cake decorating). Goodie bags for the youngest kiddos were in Jake and The Never Land Pirate buckets. Goodie bags for girls were in fairy buckets. The pirate bandanas were pink too. All of the older boys received black buckets. The goodie bags were a HUGE hit. My only mistake was handing them out about 5 minutes too soon. Sword fighting while waiting for people to get ready can become quite chaotic! When we arrived at the pool I hung up the NEW 3x5 Pirate w/ Red Bandana 3 x 5 Jolly Roger Banner , my one other decoration for the party. You can see one of the tiki torches lit right next to it. A grandparent blew up our Tick-Tock Croc and the kiddos immediately jumped into the pool. I have got to say that our crocodile was a HUGE hit. Everyone wanted a turn on it. It was the perfect decoration and activity all tied into one. 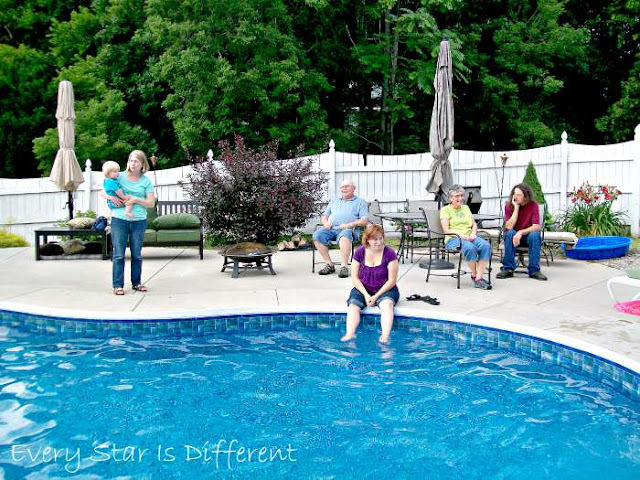 Adults relaxed by the pool, enjoying the laughter and play of the kiddos. The kiddos swam and swam and swam! 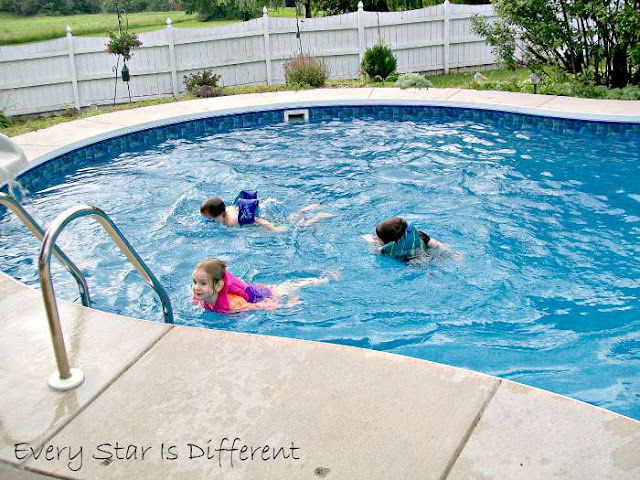 We even had a couple of friends who couldn't make it to the party at the house join us for swimming. It was a fun surprise. Bulldozer, who until this summer has NEVER EVER wanted his head to get wet was trying out some new tricks. I couldn't help but snap a picture. The kiddos had been swimming for an hour when the skies turned dark and we heard our first roar of thunder and saw our flash of lightning. And then, just like that, the party was all over. Everyone was asked to get out of the pool. Just as we made it to our cars, the rain dropped in buckets. I was so disappointed. Up to this point of the party, I had yet to relax and enjoy the fun for more than a couple minutes at a time. I hadn't had a chance to mingle or do much of anything. Other than my parents, who decided to head back to our house to watch the kiddos open gifts, everyone headed home. The kiddos didn't seem too frazzled by the transition at all. But then again, we'd practiced swimming at this friend's home on a weekly basis all summer and had already experienced this same scenario before. I am so glad we prepped them! At home the kiddos changed into pajamas. I handed out gifts and they took turns opening one at a time. I LOVE that we have ONE birthday party where they ALL receive gifts, and I don't have to worry about meltdowns, fits, etc., over someone not getting something when another person does. 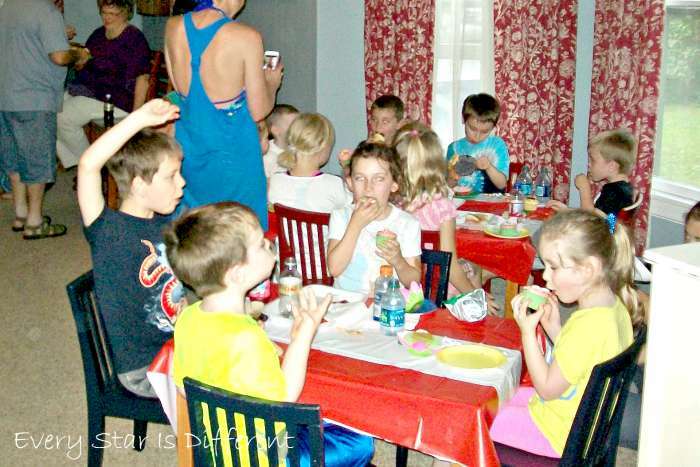 Each kiddo was permitted to invite as many friends as how old they're turning this year. We had talked about the fact that they all might not end up with the same amount of gifts to open, depending on who could come and who couldn't. But, in the end, they actually did receive the same number of presents. Lol. 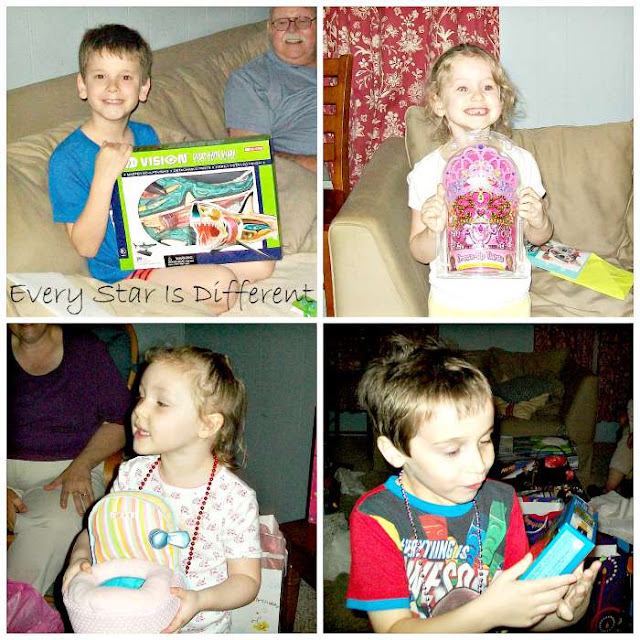 I can not tell you how excited my kiddos were as they opened each and every gift. 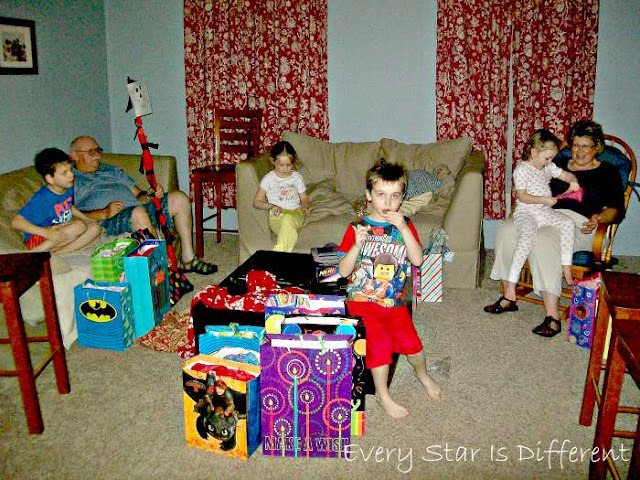 A parent mentioned earlier that evening, when the kiddos were opening gifts from friends, that she couldn't believe how grateful they were for everything they received. I admit, I have some pretty amazing kiddos! When all was said and done, my kiddos look back on this birthday with the fondest of memories. They had the time of their lives and were able to do everything they wanted to do. 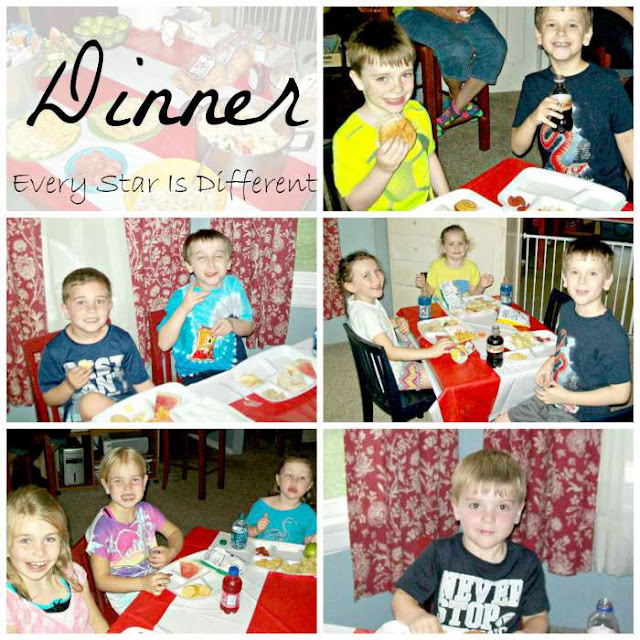 It was so much fun for them to have so many friends and extended family there to celebrate. As I listen to them talk so excitedly about it, I can't help but feel happy for them, even though my plans for the night had not turned out at all. My kiddos always teach me more than I could ever teach them. For them, it was perfect. For me, oh well, there's always next year! I've been waiting for this post :-) The party looks fun. I really love how it's a joint affair but every kid gets to add their own piece to it. Very neat. I love how you combine everyones birthday party into one big bash! This looks like a great party with lots of love shared.